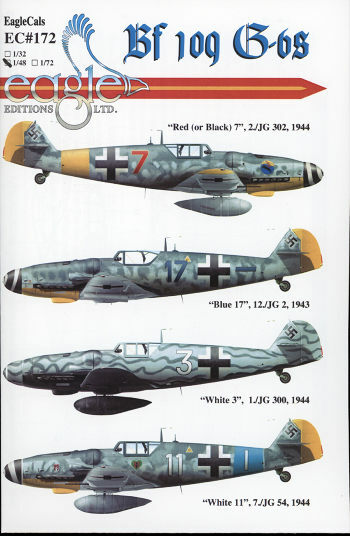 We now have another fine Bf-109 sheet for the folks at Eagle Cals. This is one for the Bf-109G-6, undoubtedly inspired by the recent Tamiya release, but applicable to any 1/48 Bf-109G-6 kit. Unless stated otherwise, all the options are in the standard RLM 74/75/76 paint scheme with varying levels of side mottling. First up is from 2./JG 300 a unit infrequently represented on a sheet. This one is from February 1944 and sports a yellow rudder, fuselage band, and lower cowling as well as lower wing tips. The number is either red or black with a yellow background. The 1./JG 300 'wilde sau' night fighter is next. White 3 has a black underside with the upper surface in RLM 76 with long squiggles of RLM 75, making for a neat camo scheme. The final option is from 7.JG 54 in early 1944. This aircraft has a blue fuselage band, yellow rudder and yellow lower cowling. Like most of the other options, it has a white spiral on the spinner. The decals are superbly done and instructions are really top notch. A full stencil placement guide is provided as well. 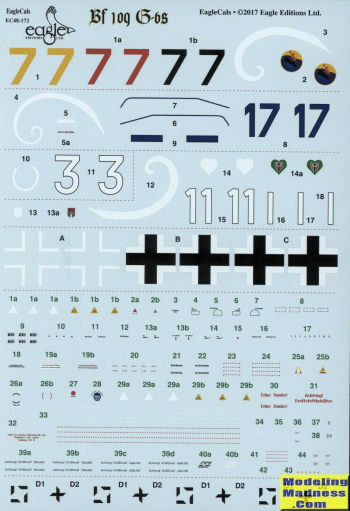 This is the 1/48 sheet, but it is also available for 1/72 and 1/32 modelers. If you are a 109 junkie as I know I am, you should pick this one up.